Review by AllTheBestFights.com: 2016-07-15, fight not particularly good between Robin Krasniqi and Juergen Doberstein: it gets two stars. Robin Krasniqi entered this fight with a professional boxing record of 45-4-0 (17 knockouts) and he is ranked as the No.22 super middleweight in the world. He lost to Juergen Braehmer last year (=Braehmer vs Krasniqi) but then he has won over Vaclav Polak and Cagri Ermis (=Krasniqi vs Ermis). His opponent, Juergen Doberstein, has an official record of 20-2-1 (6 knockouts) and he entered as the No.25 in the same weight class. He also suffered his last loss in 2015, against Cagri Ermis, but after this bout he has won three consecutive fights beating Ruben Eduardo Acosta in his last one. 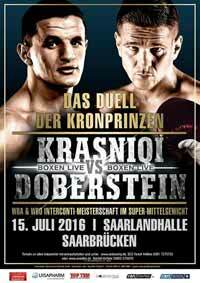 Krasniqi vs Doberstein is valid for the WBA and vacant WBO Inter-Continental super middleweight titles. Watch the video and rate this fight!